Shipping wastes, long a neglected topic, has started to attract worldwide attention, thanks to the mysterious and tragic disappearance of flight MH370. During the search for MH370, a succession of items floating in the sea were identified as possible wreckage, but later confirmed to be simply pieces of marine litter. Whilst it was large pieces of debris that complicated the search, marine debris of all sizes causes problems for users of marine resources. In the most polluted areas, around 300,000 items of debris can be found in each square kilometre. 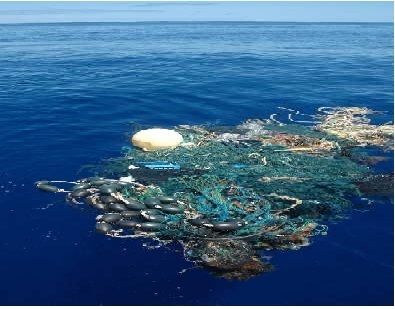 Up to 80% of ocean debris originates from land based sources, including beach litter, litter transported by rivers, and discharges of untreated municipal sewage, while ocean based sources (merchant shipping, ferries, cruise liners, fishing and military vessels) account for the remainder. Whilst typically this may be only 20% of marine litter, in areas of high shipping activity such as the North Sea it rises closer to 40%. Wastes from commercial vessels seems like an area that could be effectively tackled with regulation. However, it is difficult for individual nations or regions to take action when ships operate in international waters and the debris in our oceans is constantly on the move. So how is it addressed through international legislation? In fact, a good many laws are already in place. The key piece of legislation preventing ‘the disposal of garbage at sea’ is Annex V of the International Convention for the Prevention of Marine Pollution from Ships (MARPOL). Amongst the numerous other relevant laws are the London Convention and Protocol, the Basel Convention, UNCLOS, and the Convention on Biological Diversity. In addition, many more laws exist at regional and national levels. In the EU, laws directly related to marine debris include the Marine Strategy Framework Directive and the Directive on Port Reception Facilities. Laws indirectly related to marine debris include the Common Fisheries Policy, the Water Framework Directive, the Waste Framework Directive, the Habitats Directive…. The list goes on. Despite the profusion of legislation, the scale of the current and potential problems caused by marine debris, it is clear that implementation and enforcement is lagging behind. Why so? As yet, not all coastal or flag states have ratified international instruments such as MARPOL Annex V. This means that ships registered with a non-ratified state under a‘flag of convenience’ may legally continue to discharge garbage in international waters. However, even if the current suite of international legislation was universally ratified, this would serve to expose the remaining gaps in the framework. MARPOL Annex V includes specific requirements regarding the discharge of different types of waste and location of discharges. For instance, ground food waste can be discharged up to 3 nautical miles from land, but if it is not ground it may only be discharged at a distance of 12 nautical miles or more. Although the discharge of ‘all other garbage including plastics’ is prohibited, compliance relies upon good waste management practices on board vessels. If waste streams are contaminated, this may result in plastics and other debris being discharged into the sea. The current approach may have been developed to accommodate shipping activity, but in practice it is somewhat confusing and it would perhaps make more sense to issue a blanket ban on discharges. Another gap within MARPOL Annex V is the scope of the requirements for ‘garbage management plans’ and ‘garbage record books’. Vessels of 100 gross tonnes or more are required to have a garbage management plan, while vessels of 400 gross tonnes or more are required to have a garbage record book. Smaller vessels are not obliged to comply with the requirements. Less than 1% of vessels in the world fishing fleet have a gross tonnage of over 100 tonnes, the majority has no obligation to implement and maintain a plan or book; with no planning or record keeping, the risk of illegal disposal is increased. Small fishing vessels may not be considered ‘commercial’ shipping vessels at all – thereby avoiding legislation – but they still contribute towards the problem of marine debris. Most notably, abandoned, lost or otherwise discarded fishing gear has a considerable impact on marine species through ‘ghost fishing’. MARPOL Annex V requires the government of each ratified nation to provide facilities at ports for the reception of ship generated residues and garbage that cannot be discharged into the sea. The facilities must be adequate to meet the needs of ships using the port, without causing undue delay to ships. However, MARPOL does not prescribe any set standards or provide for certification. The term ‘adequate’ is instead defined in a qualitative (rather than quantitative) manner in Marine Environment Protection Committee (MEPC) resolution 83 (44). Furthermore, MARPOL does not set any requirements regarding how waste delivered to port reception facilities should be managed. Only the non-mandatory MEPC resolution 83 (44) requires that facilities should allow for the ultimate disposal of ships’ wastes to take place in an environmentally appropriate way. Cruise ships operate in every ocean worldwide, often in pristine coastal waters and sensitive marine ecosystems. Operators provide amenities to their passengers similar to those of luxury resort hotels, generating up to 14 tonnes of waste per day. Worldwide, the cruise industry has experienced a compound annual passenger growth rate of 7% since 1990, and the number of passengers carried is expected to increase from approximately 21 million in 2013 to 23.7 million in 2017. The majority of current legislation on pollution and ship waste was developed prior to the rapid growth of the cruise market; as a consequence, there is no international legislation addressing the particular issues surrounding pollution and waste management on these vessels. Although there is not yet data to support this, intuitively the amount of waste produced by ships would be linked to the number of people on board, rather than the vessel’s gross tonnage (which determines whether MARPOL rules apply). If the industry grows as forecasted, cruise ships may be responsible for a significant proportion of waste generated by ships, particularly if unmanned are the future. To address this, onboard waste management systems that implement zero disposal of solid waste at sea are needed for cruise ships, together with a requirement that they only dispose of their waste at ports with reception facilities adequate to handle the type and volume of waste produced. Where international and regional legislation is found lacking a number of voluntary mechanisms have been devised, indicating an appetite to improve the current waste disposal practices of the shipping industry. The Clean Shipping Index is an easy to use, transparent tool which can be used by cargo owners to evaluate the environmental performance of their sea transport providers. The information is entered on a ship-by-ship basis but is also added to a total carrier fleet score for an overall ranking. Questions on waste relate to garbage handling and crew awareness, and scores can only be obtained for measures that go beyond existing regulations. One commercial container operator (Matson Navigation) has introduced a zero solid waste discharge policy. The ‘greentainer’ programme uses containers specifically designed for storing solid waste. Since 1994, this programme has prevented over 10,000 tonnes of garbage being disposed of at sea. Currently, international legislation does not properly support a closed loop system for waste management onboard ships. Despite legislative progress and improvements in practice, the monitoring of waste from shipping remains problematic. ‘Policing the seas’ to verify what a ship discharges and where, and whether this follows recommended best practice, remains one of the most challenging aspects of waste management practice at sea, but critical to making the legal framework effective. The limitations of international legislation governing the case of marine litter disposed of at sea do need to be addressed; but unless legislation is accompanied by environmental education for seafarers, and improved monitoring, our attempts to tackle this source of marine litter will remain all at sea. Note: The article has been republished with the permission of our collaborative partner Isonomia. The original version of the article can be found at this link.